PROME, Bago Region — Police in Bago Region are investigating the suspected burglary of an ancient pagoda in the World Heritage site of Sri Ksetra but say nothing was stolen. Sri Ksetra was one of three walled and moated cities of the Pyu Kingdom — which flourished for more than 1,000 years between 200 BC and A.D. 900 — inscribed on the World Heritage List in 2014. The pagoda in question is believed to have been built between A.D. 4 and 9. 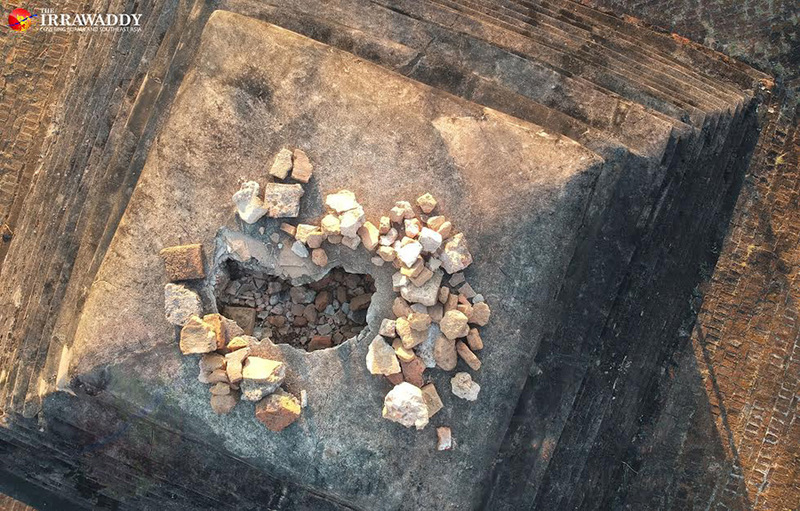 “The security guard reported to us after he spotted broken bricks on the top of the Lay Myet Hnar pagoda while patrolling along the heritage zone yesterday,” Lieutenant Zeya Lin, of Prome Township’s Police Station No. 3, told The Irrawaddy on Friday. “So we have opened a case under Section 26 of the Protection and Preservation of Cultural Regions Law. We will identify the vandals,” he added. U Soe Min, assistant director of the Department of Archaeology, National Museum and Library for Sri Ksetra, told The Irrawaddy that there was nothing valuable inside the temple. “It must be connected with smuggling of artefacts in the zone,” he said of the suspected burglary, adding that his department has received reports of artefact trafficking in the area but yet to catch anyone. “We are cooperating with police to prevent this,” he said. A waterproof concrete layer on top of the pagoda was damaged, but it is not part of the original structure, said U Soe Min. “The temple is ancient heritage, but the waterproof concrete layer is not. It was done before [Sri Ksetra] was inscribed on the UNESCO World Heritage List. It is not original concrete. But [damaging it] is still an offence under the law,” he said. In November, signboards and a bridge in the zone were vandalized, a visitor’s motorbike was stolen, and a couple was robbed by a group of men. The vandalism was the first of its kind in a decade, prompting the Archeology Department to start nighttime patrols.